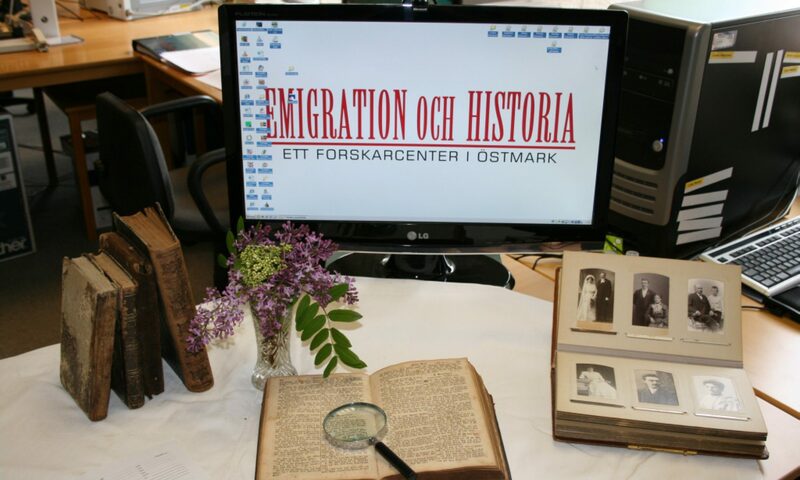 The society of Emigration och Historia is with its register of Swedish emigrants, archive of church books and photographs a valuable source of information to those interested in family history research and/or local history. In addition to its focus on Värmland, the society links to other research centers in the country as well. If you feel like exploring your family tree or if you’re simply curious about the lives of past generations, we recommend a visit to us here in Östmark. Welcome! A database for family history research focusing on northern Värmland containing about 70,000 names. A list of Sweden’s citizens 1880, 1890, 1900, 1980 and 1990. Sweden’s death index for the years 1901-2009, and a database over people buried in Sweden. Internet-based church book databases, Arkiv Digital and SVAR. A database on about 62,000 Swedish estates. A register of blacksmith families from year 1560 to 1930. A database with about 5,500 newspaper cuttings, available to view in binders. A database with about 6,000 photographs from the collection of Yngve Fredsberg, also available in binders for viewing. Birth-, wedding- and death index books of the parishes of Östmark, Lekvattnet and Fryksände. Östmark confirmation photographs from the year 1900 and forward, as well as confirmation lists from 1895 to present time. “Personsökaren” with birth index books of the parishes of Fryksände 1707-1830 and 1765-1860. “Emigranten Populär 2006” with information on Swedish emigrants. If you’re looking for information about some of the many Swedes who emigrated to North America in the nineteenth and twentieth centuries, the ever-growing online database EmiWeb might be of help. EmiWeb contains all our previous databases and is a web based system developed at Emigration och Historia and further developed at Sverige-Amerika Centret in Karlstad. A collection of 1,700 photos of emigrants from the photo archive of Sverige-Amerika Centret. We also have a database with 1,4 million Swedish passengers who went by boat to America from six Swedish harbors between the years 1859 and 1930. Another new thing is the access to Ancestry.com the worlds largest web system with historical collections from USA and Canada among others. It contains passenger lists from New York, Boston and a couple of Canadian harbors. Furthermore it contains census lists, military registers, American passport applications and the worlds largest family tree containing over 6 billion records.